The present-day location of the village dates back to Roman times when it was known as Nisdomia. The village gained its independence from Orihuela in 1836, though originally its municipal district was constituted by just the old centre. 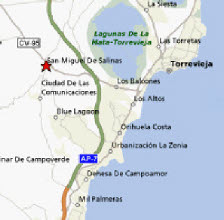 This was extended in 1955 to include the area between the Pedrera Reservoir, the Torrevieja Lake and the Águila Crag. The village's main activity is agriculture, especially dry crops, cereals and pulses. Since 1955 the village has farmed 265 hectares of land irrigated by an irrigation canal of Levante, taking advantage of the Tajo-Segura diversion. From the 28-30 of September patron saint feast day celebrations are held in honour of the Archangel St Michael, with open-air celebrations and a procession.